I was not looking to create an overpoweringly sweet dish, so I incorporated a fusion of Indian spices and a little bit of smokiness into the crab cakes to temper the heat from the mango and green apple. It worked - the crab cakes were flavorful, but not particularly sweet, though they did have little pockets of sweetness here and there (mostly when you bit into an apple), but as a whole, they were not sweet. The chipotle puree adds a smokiness that tempers the sweetness, but does not add any heat. The crab cakes also had a beautiful magenta color, thanks to the beets. Every time I cook with beets (which isn't all that often, to be honest), I forget the reason I do not normally cook with beets. They turn everything in their path magenta. This is something to keep in mind when you make this recipe, for sure. Even one beet has its way with turning everything in your kitchen magenta if you are not careful. I decided to serve these crab cakes with a sweet, but also spicy chutney. In the past, I have made Tabla's green apple chutney, using the recipe from the New York Indian-American fusion restaurant in the cookbook, One Spice, Two Spice . For tonight's recipe, I used Tabla's chutney as a reference, but modified the recipe (also using a variety of indian spices) to create my own green apple chutney. I actually don't eat a lot of Indian food. I generally find the dishes too heavy. However, I love cooking with Indian spices in my own cuisine, for a fusion of Indian and American traditions. My approach to American cooking often incorporates this fusion approach with other ethnic cusines. I actually consider this to be true American cooking since America really is a melting pot of its cultural influences; so is American cooking. To prepare the crabcakes, saute the apples, mango, onions beets (which need to be cooked by boiling in a pot of water for about 25 minutes first), pistachio oil and spices in a tablespoon or two of canola oil, until all of the fruits and onions are soft. Take off the heat and beat in two eggs. Mix in the crab meat. Then dredge and coat the crab cakes in the panko bread crumbs. The next step is to cook the crab cakes by frying them with canola oil. Cook them for long enough on both sides so that they are cooked through. I love making chutneys, ever since I discovered tropical chutneys as a kid (my first was jerk chicken with a mango chutney). They always have a jam-like consistency and every chutney that you will make includes the basic ingredients of a fruit, a sugar and vinegar. To prepare this chutney, simply combine the apples, apple cider and vinegar. Add a sachet bag with the additional spices and bring to a boil. Then add the other ingredients and simmer for abut 30 minutes until the chutney has a jam-like thickened consistency. Add the lemon juice at the end when you take it off the heat, as this helps balance the flavors. Black salt is an Indian salt (you can find it at an Indian Market) called Kala Namak that was a carry-over from the Tabla recipe in this dish. It is actually pale pink in color. It is often used in chutneys and other Indian condiments to balance out the flavors, even though it has a pungent oder prior to incorporating it into the dish. Dried pomegranate seeds are also available at most Indian markets. Serve the crab cakes with the chutney on the side, with diced chives. This dish paired nicely with a beer called Domaine DuPage from the Two Brothers Brewing Company, a Chicago-based brewery, that we picked up at Bierkraft. 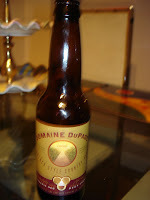 This beer is a French-style country amber ale with hints of caramel and a light floral finish. Crab is one of the ingredients of the month on A Kitchen In Brooklyn. For another crab cake recipe, click here. For my crab couscous, click here.